Want something lovable and squeezable for your kids that incredibly soft and cozy for bedtime? look no further than the hippo sleeping bag. 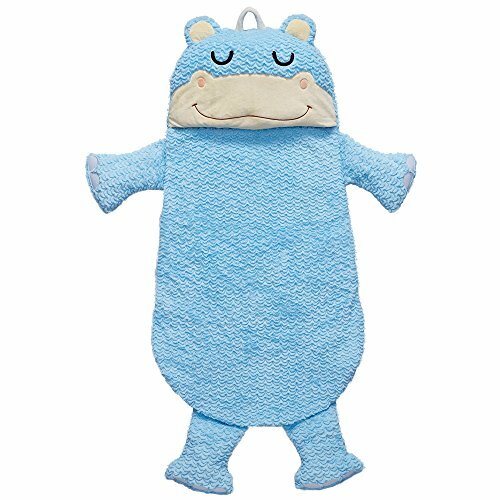 Sleeping bag features a Super soft hippo that your kids will love slipping into at the end of the day or during nap time. Head of sleeping bag features a hippo face that can be used as a pillow. Arms are also attached so when children need that extra love and affection they can have a hug from their new best friend. What a great way to combine a security blanket and a stuffed animal into one. Bring the friendly hippopotamus to your children's rooms and sleepovers, to make sleep time feel like a campout with their favorite cuddly animal friends. The best choice for a slumber party! sleeping bag has a plush animal face that can be used as a pillow. Suitable for children up to 4' tall. From age 3 and older, let them slip into the sleeping bag and have a good night dream. Sleeping bag: 60.5 X42.25 x 4 . throw pillow: 17 x10 x8 . Complies with cpai-75 U.S. Flammability test requirements for sleeping bags. Gives your children warm, cozy and safe sleep time!